This article covers the navigation and functions of the Agenda. Welcome to a responsive calendar dashboard, the Agenda. The Agenda greets you as you enter the TheraNest application presenting the day's events. Agenda is seamlessly integrated with the calendar and features shortcuts for navigating across views, create appointment(s) and optional filtering. You can navigate to the Agenda in two places. Click on the Agenda option in the primary navigation bar or via the calendar toggle view to return to the Agenda. The Agenda will always default to today's date but you can easily go back to any previous date or even jump ahead to a future date. Simply click on the date in the date box to select another date. To get back to today simply click on the "Today" option next to the date box. The Agenda consists of Event Cards. An event card appears in a single block featuring the Appointment Details, Client, Balance information, Staff, Appointment Status, and key actions. The green time bar indicates where you are at in the day with previous appointments appearing in grey and upcoming appointments in blue. Click on the appointment date and time to view/edit the appointment. Customize your Agenda view with filtering options to best suit your needs. The save option for the Location, Staff, and Service Type options will apply the filtering across the Agenda, Day, Week, Month, and Staff views. Use the date picker option to quickly switch the day in view. 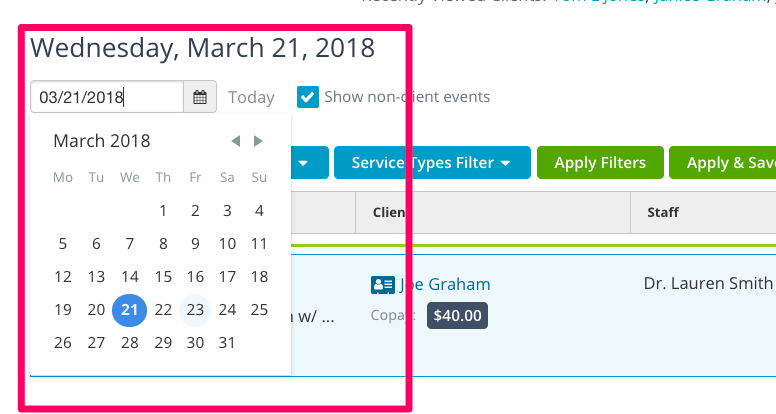 Click the non-client event filter to show or hide non-client events from view. 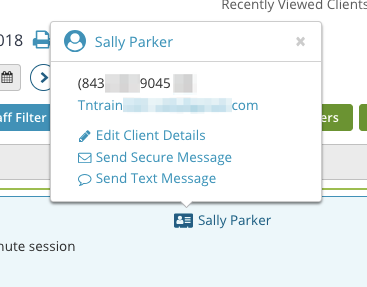 Click on the card icon next to any client name and the contact card will appear showcasing populated phone and/or email information. Click Edit Client Details to quickly access the client's profile details. When a client is registered on the Client Portal with Secure Messaging enabled, a Send Secure Message link will also be available as a shortcut to a new secure message. If you have also enabled Text Message Appointment reminders you will see the option to send a client a text message as well. Standard rates apply. 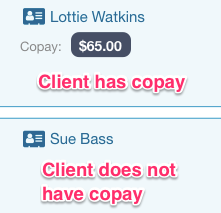 Reference the copay amount for insurance clients below the name. 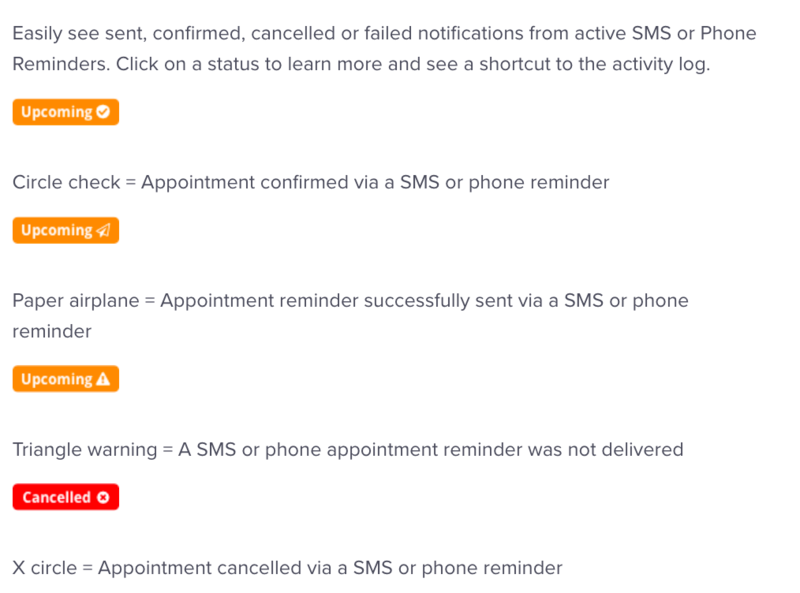 Easily see sent, confirmed, cancelled or failed notifications from active SMS or Phone Reminders. Click on a status to learn more and see a shortcut to the activity log. Quickly See Appointments that need a Note and/or Invoice and their status. 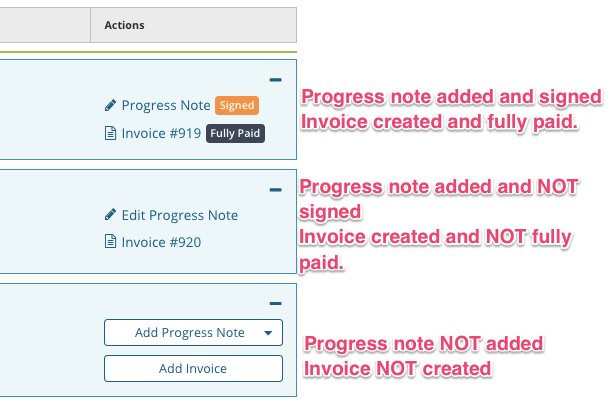 Appointments feature options to add or edit existing progress notes and invoices making it easy to see any action items. Easily expand or collapse your agenda all at once or line by line!